Well over a year has passed since a British engine received Engine Of The Day honors, so let's visit the legendary "Torqueless Wonder" Lotus. A quick perusal of online descriptions of the 900's history makes it clear that the best way to drive a Lotus fanatic nuts is to ask "Hey, wasn't that there engine based on the Vauxhall Slant Four?" Long story short, Lotus used the Vauxhall engine block for cylinder-head development, as the Vaux's bore centers were identical to the planned Lotus engine's. 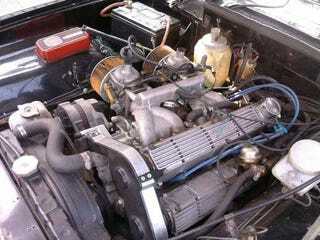 Engines in the 900 series were manufactured for nearly 30 years and powered the Elite, Eclat, and Esprit, plus the Jensen-Healey. Available in 2.0 and 2.2 liter displacements, the most powerful production 900s produced 280 horsepower in turbocharged form.